Today we’re gonna be talking about Canada’s new food guide that was just released last week. I’m going to give you some thoughts about it, a little overview about what it actually talks about, four things that I would change about it to make it a little bit more optimal: the good, the bad, and thankfully with this edition, not so ugly! So let’s get right into it. 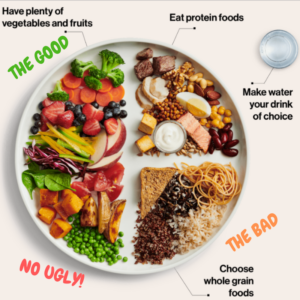 If you take a look at Canada’s Food Guide, which you can look up here, it’s broken down into an infographic with a plate. Half the plate is represented with fruits and vegetables. A quarter of the plate is represented with food sources of high-quality protein and then another quarter of it is listed as gains. When you look at these individual food groups, what you’re going to see is different types of animal-based and plant-based protein in the protein section, you will see a lot of whole grain breads, pastas, quinoias and rice in the grain section and then in the fruits and vegetables section it’s recommended that half of your plate should be a combination of fruits and vegetables. In the vegetable section, you see some carrots, broccoli, strawberries, blueberries, greens like spinach, sweet potatoes, and peas. All in all the infographic is great. I think they’ve done a really good job giving a good visual representation of what a really nutritious meal would look like. And I think that for the majority of people, if you were to eat like this every meal, you’re going to be satisfying the majority of the needs of the body in terms of what nutrients it requires to be healthy. If you follow this, I think you can be healthy. I think you’re going to get the nutrients that your body needs. I do however have a couple of quips with the food guide. I’m going to get to that in a second. The other thing that I think they’ve done really well is taking a really holistic approach to eating. In the eating habits section, they talk about things that have good evidence behind them that have an important impact on the way we eat that truly have an effect on our health and our nutrition. They talk about things about being mindful of eating habits. We know that in societies like Japan, they have a saying that one should stop eating when you’re 80 percent full: the more mindful you are, the less likely you are to overconsume it. They also discuss the importance of cooking more often; when you cook more often you have more control of the food that enters into your body. I love that this discusses “enjoying your food” and “eating meals with others” as I think these are really important principles that are often not discussed enough. Unfortunately, nutrition and eating can be broken down to this monotonous, awful task that creates frustration and anxiety in people rather than something we all enjoy and that gives us pleasure. I really like that the new food guide takes a holistic approach that addresses some of these qualitative and experiential issues. There however are four things that I would change in this guide to make it better. We talk about these things in our Fundamental Fuel Curriculum where we talk about the 11 principles that will guide your eating habits or give you the principles to give the nutrients to your body that it needs. The first problem I have with the food guide is the fruits and vegetables section and my problem with it is not the size of it. I think that the 50 percent part is good but only if it is mostly vegetables. Fruit does contain nutrients but they also contain a lot of simple sugars which your body does not need. Your body needs the nutrients that come in the vegetables and if you have room for dessert, that’s where I think the fruits should go. In general, the fruits should make up a smaller portion and far less than half a plate. So change number one, I would make half your plate vegetables, especially leafy greens, broccoli, sweet potatoes, carrots, and anything else with lots of colors. The other thing that I would change is that I would shrink the grain section. Why? Because our body does not require grains in order to survive, period. We actually don’t even really require carbohydrates to survive, but that’s a point of discussion for another day. Simply the grains are not an optimal nutrient source. You can eat other things that contain macronutrients like carbohydrates and protein but have more nutrients in them. Grains, even whole grains are going to be highly processed or more processed and thus nutrients are taken out of them. So if we’re talking about efficiency and you want to be a little bit more optimal, I would shrink that grain section to half of what it is or zero of what it is. If you were to consume, say as sweet potato instead of a piece of bread, you would get much more nutrient content out of it for the same number of calories you’re going to consume. If you are an athlete or are regularly exercising, there will be a need to consume more carbs. The other thing that I think should be changed is the some of the recipes call for less nutritious oils like canola oil and call for using margarine. Frankly, margarine is garbage. We know that when we demonize saturated fat, it’s not actually in line with what the research tells us. Fats do not make you fat. Saturated fat and unsaturated fat are required by the body in order for it to function properly in order for us to survive. Whether it is saturated fat or cholesterol, the body needs these ingredients in order to build things. The recipes that demonizes saturated fats and suggest using a low-fat cottage cheese or low-fat yogurt or to use margarine instead of butter should be revised. Use butter and if you want to be particular, use grass fed butter as it’s going to be a higher quality nutrient source. It is okay to have a higher fat yogurt or cheese in your diet. It is not going to kill you and in fact, it’s going to give you more nutrients and it taste more delicious. Don’t demonize saturated fats. Ignore the recipe when it says to use canola oil and use coconut oil, olive oil, grape seed oil or avocado oil; all are higher quality oils that are going to be more nutrient filled with more mono-unsaturated fats. If you want to learn more about why that is important, check out our Fundamental Fuel Curriculum. It’ll gives you some of the background information you might need to make better decisions. Last two objections are again to not demonize saturated fat and make sure that if you’re using any of the recipes that you use olive, coconut, grapeseed or avocado oil and butter instead of the recommended margarine and canola oil. I think overall they’ve done a really, really good job. I think you could do an even better job that might be in line with a higher level of health and I would recommend again reading our Fundamental Fuel Curriculum to get some more details or just make those for changes that we talked about today.